St. Mary with St. Leonard News | A Light in the darkness? The afternoon service ‘Sunday Special’ for young families was brilliant! 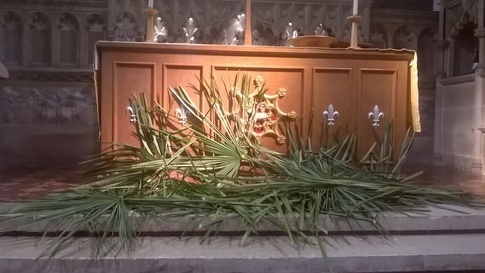 Revd Julie started off by telling us the Palm Sunday story in a ‘nutshell’ a coconut shell actually, as we were all very disappointed when one of our younger members opened up an Easter egg only to find a coconut shell enclosed as opposed to a yummy chocolate egg. Revd Julie used the nutshell to explain the story to us after which we went on to engage in some satisfying and exciting craft work… The puppet crew performed for our delight before afternoon tea was served. At Evening Prayer, we heard again the ‘Liturgy of the Passion’ beautifully read to us by Trudy Stevens. In her sermon Revd Diana looked at the Passion of our Lord in a slightly different light, saying how despite the travesty of a trial and our lord’s torment on the cross there were still fragments of light that came through the Passion story. How the people followed Jesus through his torment, how Pontius Pilate and Herod became friends after many years as enemies, how his cross was carried by Simon of Cyrene, How people beat their breasts in anguish and how after hearing Jesus cry out to God and taking his final breath the Centurion saw Jesus’ worth and praising God he pronounced Jesus innocent.